This is a slab in Niterói — one of the best and heaviest waves around, breaking just in front of a big rock that allows people to watch the action close enough to feel the power of the waves. Filipe Toledo at Barrinha, Saquarema, warming up for the WSL contest in this insane wedge break. Eric de Souza at Barrinha. Just slowing down to see the lip fall. São Conrado is a heavy beach break in the middle of Rio de Janeiro. It's perfect for tow sessions when it's big. Here's Ian Vaz in a good one. This is a slab about an hour out of Rio de Janeiro. It's heavy and only works on rare conditions. Marcelo Trekinho surfing the beast. Another one from outside Rio de Janeiro. Daniel Rangel finding the good one. Kind of secret not to far from Rio de Janeiro. But far enough to keep it empty all the time! Stephan Figueiredo in a Rio de Janeiro. Another one from Leme, another barrel. Marcelo Trekinho. Marcelo Luccas, a local at Copacabana. This is a secret spot near Guanabara bay, Rio de Janeiro. A perfect right slab. The girl from Ipanema. A slab in the famous Rio de Janeiro's beach of Ipanema. A gift for Vitor Gioraneli. Pedro Scooby at "Shock," a slab with lot of possibilities to explore. Eric de Souza framed perfectly at Shock. Daniel Rangel taking a perfect line in one of the most perfect slabs in Rio. We'll just keep this one secret, though. This is a collection of photos I’ve taken in 2018 around Rio de Janeiro. We received some good-sized swell this season with a few days where the right conditions came together for some of Brazil’s slabs and heavy beach breaks. And that’s the whole pursuit, right? Finding the best and heaviest barrels. 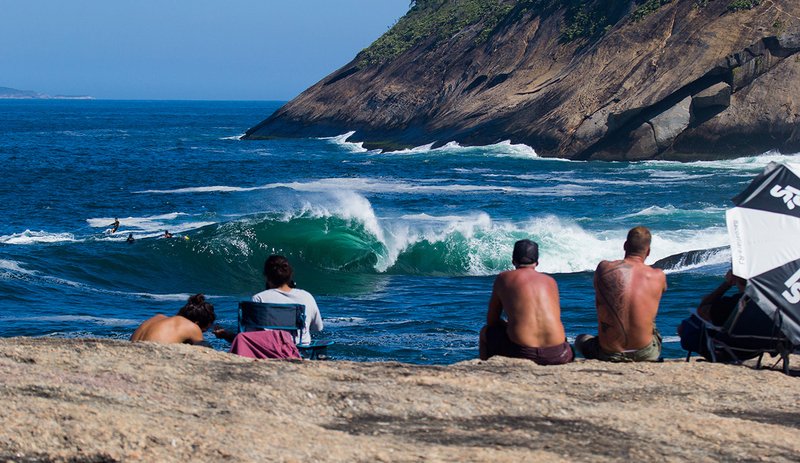 Brazil may not be very famous for this particular kind of wave but we’re always searching for some good moments.